Our 4,000+ square foot store sells gently-used clothing, housewares, electronics, home décor, books, furniture and more! We even have a vintage boutique filled with collectables and memories from the past. HSCAZ’s Feeding Fido program provides pet food for pet owners who are struggling to feed their pets due to financial hardship. Our goal is to help keep pets in their home and out of the shelter by providing assistance to those in need. 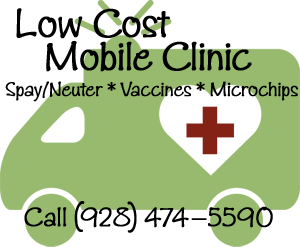 HSCAZ is the only outlet for low-cost spay and neuter services offered through the Voucher Program and our Low-Cost Mobile Clinic. The clinic is meant to make spay and neuter of companion animals possible for those in our communities who have been most negatively impacted in the economic downturn. It is our mission at HSCAZ to promote humane values to benefit people and animals. With this goal in mind, we offer educational presentations to Payson schools that wish to participate in our Character Counts Project. This project is designed to complement the character education programs of local school and educate children about humane values. HSCAZ believes this will support the development of compassionate adults who embrace animals and strive to enhance the bond between people and animals for the rest of their lives. For more information regarding the program or to schedule a presentation please email hs@humanesocietycentralaz.org. The Humane Society of Central Arizona’s Humanitarian Hold program provides short-term care for companion animals of at risk individuals/families, elderly, disabled, and children who must leave their home temporarily due to hospitalizations, rehabilitation, domestic violence, homelessness or other life altering circumstances. On average HSCAZ provides temporary housing of 60-80 animals every year. The 30 day program provides food, care and the daily needs to the animals housed during their temporary stay. The animal’s medical needs are met by providing vaccines for those who do not have them. We council the owners on the importance of spay and neuter and offer to enroll them into our voucher program so they can be altered at no cost to the owner. These actions have provided the comfort of knowing that their family members are being taken care while these individuals/families work through their life altering situation and will be reunited with their companion animal, giving hope for a brighter future.